Graduate students from the UT Health Science Center worked with over 100 elementary, middle, and high school students to try and set a new world record for the largest periodic table of elements yesterday. 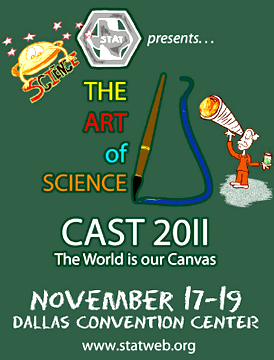 Every school chose an element and painted a canvas tarp for that element. As I mentioned in a previous post, our high school team chose iron because it is the 26th element and Theodore Roosevelt (the name of my school) was the 26th president. Each decorated tarp is 12 feet by 15 feet. When put together, the entire periodic table of 118 chemical elements is more than 22,000 square feet. That makes it big enough to cover most of the football field at Gustafson Stadium. We Have Iron For The World’s Largest Periodic Table! Thanks to the team at the Teacher Enrichment Initiatives (TEI) in the Department of Medicine at the University of Texas Health Science Center a San Antonio (UTHSCSA), we have been invited to join in the construction of the world’s largest periodic table! UTHSCSA’s TEI seeks partnerships between the faculty and staff of UTHSCSA and K-12 teachers in the San Antonio area. They offer a wealth of resources for science teachers, including a multidisciplinary health science curriculum aligned to state and national educational standards, and teacher professional development programs. Speak softly and carry a big stick; you will go far. Bully! I think that Mr. Roosevelt would be proud! I went to Dallas for this year’s Conference for the Advancement of Science Teaching (CAST), the annual statewide meeting of the Science Teachers Association of Texas (STAT). It was fun and exciting to see the vendor booths, attend informative sessions, and to meet and talk with science teachers from all over Texas. I learned a lot from both experienced and novice teachers as they shared with me their various ideas and tips that they took from their teaching toolboxes. I also attended a luncheon hosted by the Associated Chemistry Teachers of Texas (ACT2), the chemistry affiliate of STAT. They acted as hosts to Jonathan Bergmann, their guest speaker. Bergmann talked about how he, along with fellow Colorado chemistry teacher Aaron Sams, flipped his chemistry classroom in order to provide more class time for student help and less for lecture. This work is licensed under a Creative Commons License unless otherwise noted.